This is an example of the type of code that can be found in many demo samples (including some on my site). It features a controller action method that responds to a POST request and generates and sends an email message from the posted form values represented as a view model. So what's wrong with it? If you want to change your emailing system over to e.g. 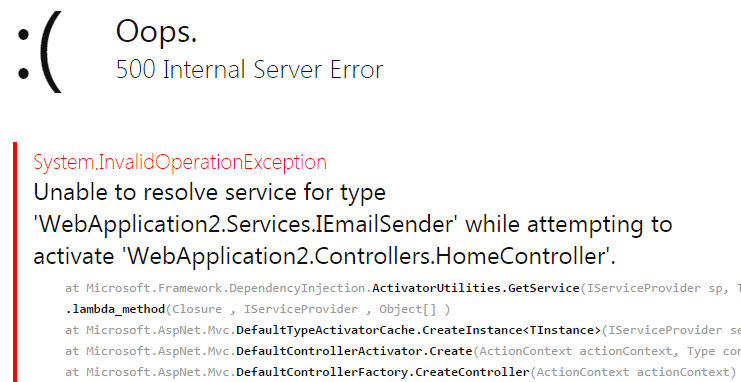 Exchange Web Services, you have to make changes to the controller class . This violates the Single Responsibility Principal. The controller class should only be responsible for martialling data for views. It should not be responsible for sending email. Changing the code concerning one of the controller class's responsibilities could result in bugs being introduced into its other responsibilities. If you have similar emailing functionality in multiple places in the application, you have to make the same change multiple times. The more places you have to make changes in, the more chance there is of you introducing other bugs to other parts of the application - or overlooking one or more areas where the change needs to be applied. If you want to unit test your controller's Contact method (to ensure it returns the correct View, for example), you will not be able to do so without generating an email. This will require communication with outside processes, which will slow tests down. Your test may fail because of some failure in the mail sending routine rather than any logical failure in view selection (which is what a unit test is supposed to cover). This is better, because now the controller has no knowledge of how emails are sent. As far as the controller is concerned, the EmailSender class is a black box that encapsulates the details of how emails are generated and dispatched. All the controller class needs to know is that the EmailSender class offers a SendEmailAsync method that accepts some strings. If you want to change anything to do with sending emails, you change the EmailSender class/component only. You don't have to change the controller code at all. This eliminates the possibility of new errors being introduced into the controller class when updates to emailing routines are being made. It also saves time as you don't have to make identical changes in any other places where email is sent. But there is still a problem. The controller is still dependent on (tightly coupled with) a specific (or concrete) type of email component. When you test the controller action, an email will still get sent. You could makes changes to the code to replace the EmailSender class with a MockEmailSender class that doesn't actually do anything whenever you want to run your tests. However, having to do that in multiple places, and for all the other services that rely on outside processes (logging, data access etc.) every time you wanted to run your tests, and then reversing all the changes afterwards is not a practical solution. The reality is that you are unlikely to bother to execute your tests at all. The truth is that you can stop refactoring at this point. This is an example of dependency injection - known by the slightly pejorative term "poor man's dependency injection". The code within the controller follows the maxim "program to an interface", which decouples the controller from a specific implementation (apart from in its constructor), and enables separation of concerns. If you have no plans to unit test your code, and you can see no good reason for changing the implementation of your IEmailSender at the moment (i.e. it is not part of the requirement spec to do so) then you can go on your merry way and this code is just fine. However, you might want to continue reading to find out how to further decouple the dependency, and to learn about the dependency injection system in ASP.NET Core. The exception is generated because, at the moment, there is no way for the application to know what concrete type IEmailSender should be resolved to. You cannot instantiate an interface and start calling methods on it. It's an abstraction and the methods it defines have no implementation. You can see from the message above that the exception is generated by the new Dependency Injection framework, and it is this that needs to be told what to use whenever it encounters IEmailSender. You do this by adding a registration to a dependency injection container. DI Containers at their simplest are little more than dictionary-like structures that store the abstraction and the concrete type that should be invoked wherever the abstraction used. Most DI containers offer far more functionality than that, but, at their core, that's all they are - a kind of look-up table. Dependency Injection is not new in ASP.NET MVC. People have been doing it for years and using a variety of third party DI containers to manage the the resolving of types. What is new in MVC 6 is that a very basic DI container is included as part of the framework. It is minimalistic and doesn't cover advanced use cases, but should be adequate for most common scenarios. The EmailSender was registered with Transient scope via the AddTransient<TService, TImplementation> method. Services registered with Transient scope are created whenever it is needed within the application. That means that a new instance of the EmailSender class will be created by the dependency injection framework every time the Contact method is executed. Two other Lifetime values can be seen in the image: Singleton and Scoped. Singletons are registered via the AddSingleton method and will result in one instance of the service being created on application start and being made available to all requests thereafter. Items added with a Scoped lifetime via the AddScoped method are available for the duration of the request. There is also an AddInstance method that enables you to register a singleton, but you are responsible for creating the intance rather than leaving it to the DI system. As I said previously, the built in dependency injection system is quite light on features. Each item has to be registered manually. It is expected that the developers of existing, more advanced dependency injection containers will undertake the work required to make their systems compatible with the requirements of ASP.NET Core to enable easy use of them instead of the default container. This article began by taking a look at the need for dependency injection in an ASP.NET MVC application, and then explored the ASP.NET Core dependency injection system and covered the creation, registration and consumption of a simple service.